The field of dentistry offers many different types of jobs and career options at a variety of educational and professional levels. Dentists and other dental professionals enjoy career stability and a choice of many career opportunities. Dentistry involves a broad range of professionals, from doctorate level to administrative level people. All of these dental professionals work together to provide oral care and dental health maintenance services from cleanings to more specialized procedures and surgeries. Below is a brief overview of some of the career options in the field of dentistry. General Dentist (DDS): A general dentist is similar to the primary care doctor of medicine. The general dentist provides cleanings and general dental health care prevention and maintenance such as teeth cleaning, fluoride treatments, cavity fillings, and root canals. Cosmetic Dentists: A cosmetic dentist specializes in aesthetic dentistry, intended to approve appearance more than to improve the patient’s health. Cosmetic dentists may also practice general, or primary dentistry in addition to cosmetic dentistry. Some of the most common cosmetic dentistry procedures are teeth whitening, veneers, and bonding of teeth. Orthodontist: An orthodontist specializes in the jaw alignment and positioning of the teeth. Orthodontists utilize a variety of methods and oral appliances to help straighten and realign crooked or misaligned teeth. Braces, retainers, and other devices help correct and straighten patients’ teeth. Orthodontists primarily treat younger patients, while they are growing and the teeth are easier to move, but patients of all ages may consult an orthodontist as well. Periodontist: a periodontist is a dentist who specializes in the care of the gums and tissue surrounding the teeth. Oral Surgeon: An oral surgeon provides surgical care for the teeth, jaws, and facial bones. Patients are typically referred to an oral surgeon by a general dentist or other healthcare professional who may identify the need for oral surgery. Dental Assistant: Dental assistants help dentists with a variety of tasks but are not qualified to do full cleanings and identify cavities as are dental hygienists. 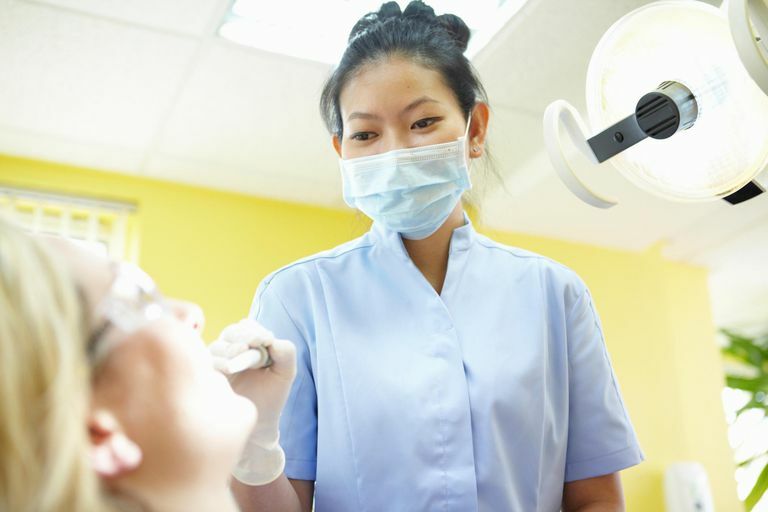 Dental assistants can obtain training at a technical school with a brief diploma program, or on-the-job. Dental Hygienist: Dental hygienists can provide some basic dental care under the supervision of a licensed dentist. More education is required to become a hygienist than an assistant, and therefore hygienists earn about twice as much money as dental assistants. Dental Lab Technician: Dental lab technicians play a non-clinical role, meaning they do not work directly with patients. Dental lab techs work in a lab, behind the scenes, manufacturing crowns and other dental prostheses which require custom specifications. Dentists use molds and x-rays to provide the specifications to the lab for a custom fit. In addition to the clinical roles above, the field of dentistry also offers a variety of administrative roles, similar to those in medical offices. These include receptionists, appointment schedulers, accounting, and billing professionals. Since dentists do not have a need to be affiliated with hospitals, the options of practice environments are primarily limited to dental offices. However, there are a variety of employers who need dental professionals such as the military and other government institutions, in addition to private dental practices. Also, there are a lot of dental corporations and franchises that provide a variety of types of dentistry including cosmetic and orthodontic. Think You Might Want to Pursue a Career in Obstetrics and Gynecology? What Types of Careers Are Available in Pathology?